Having a specialist focus allows Trust K9 to work with General Pest Control and Facilities Management Companies, offering an extension of your services. Trust K9 are Bed Bug Experts. We focus all our training and resources into Bed Bug Management and can tailor make a bed bug management program for individual sites or homes we also offer a 6 month guarantee on our Bed Bug Heat Treatment. Extend your service offering to Clients by using our unbranded bed bug solutions, from Bed Bug Sniffer Dogs to Heat Treatment. We offer our services to you at reduced rates and you simply sell them on to your Clients. 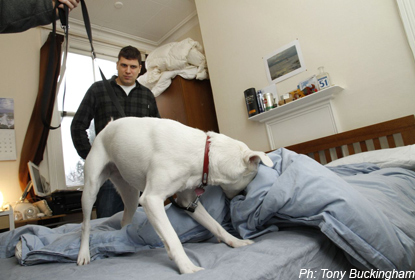 Bed bug dogs can cover large areas and can identify problem rooms in minutes. Trust K9 has the largest dog team in the UK, allowing us to search 100s of rooms a day.If the dogs detect problem areas, this allows you to step in and treat in your usual way or look at our Heat Treatment options. Heat treatment is the only method which gives instant results. Bed bug eggs are resistant to chemicals, but heat kills both bed bugs and their eggs, immediately.Customers can rent treated rooms the same day as treatment is completed. Marketing We can provide marketing brochures with your Company Logo and branding, call us for more details.